Jon Korta, living in Galena village, lent me his tent kindly. I am carrying it as the spare tent. If my tent, which I made emergency repairs, will be completely broken, I will use his tent. I am thankful although it is restricting the kayak space for food, because the tent is very important tool and I have to discontinue this expedition if it will be broken. 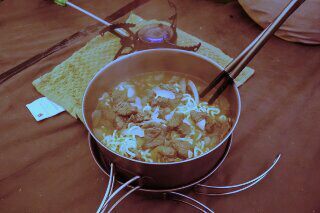 Today's breakfast was delicious moose noodle.